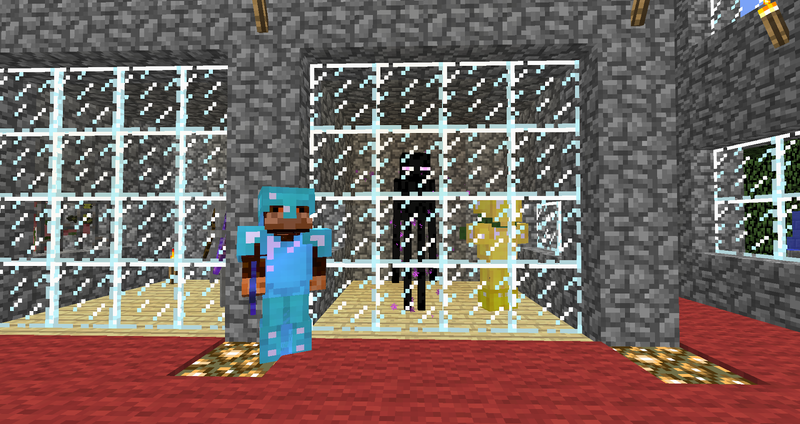 2builders2tools, better known as 2b2t, is the paramount anarchy server of Minecraft. 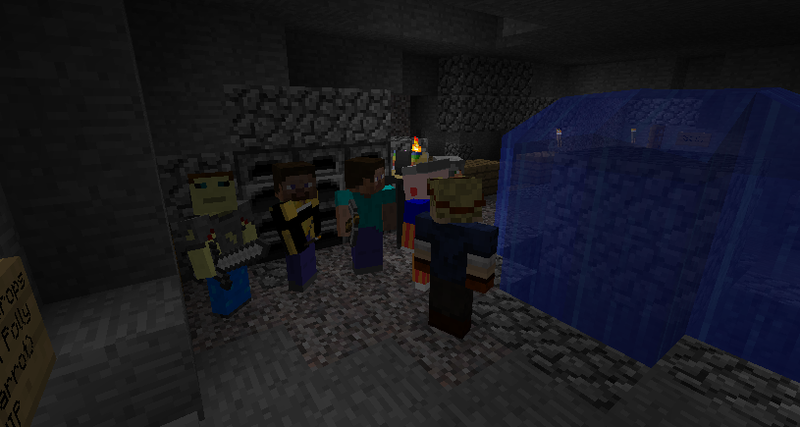 It is famous for running vanilla survival gameplay on the same world since 2010, and infamous for its less than politically correct chat (to put it mildly) and complete lack of rules. 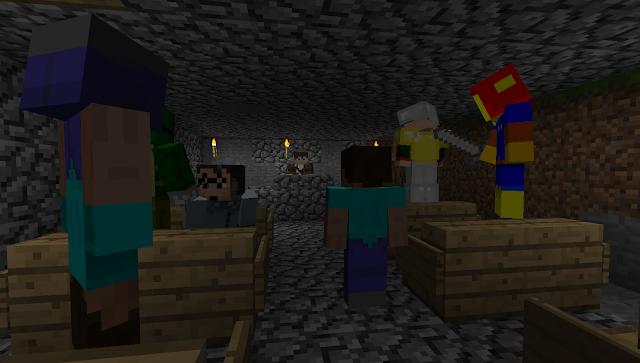 Newcomers arriving at spawn are often hard pressed to survive. Those that do not starve to death are often slaughtered for their possessions, or just for fun. Bases are burned to the ground, looted, and marked with symbols of hate. 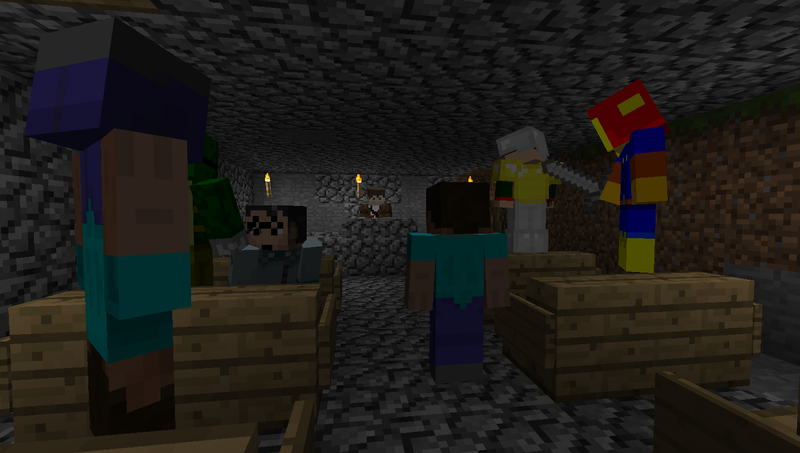 Factions battle one another while predators purge the weak who stumble naked through the ruins of spawn. Those that escape this area sometimes rise to form alliances and build larger bases or even small cities that they are able to hold and defend for a time, but even those inevitably face their doom, either from determined enemies or random griefers intent on destroying anything they can find. 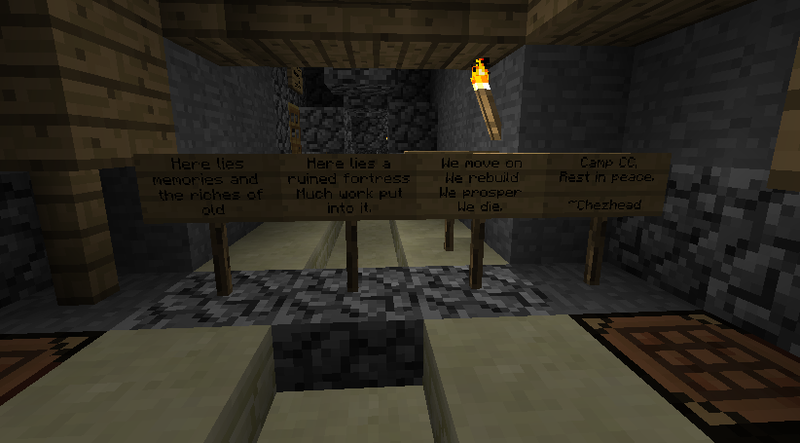 Such is the harsh reality and fun of this server. Yet far from spawn is an entirely different world, one that does not even begin to emerge until a player has traveled at least a million blocks from their original spawn point. Here, surroundings are largely untouched. Jungle or desert temples still contain their riches. 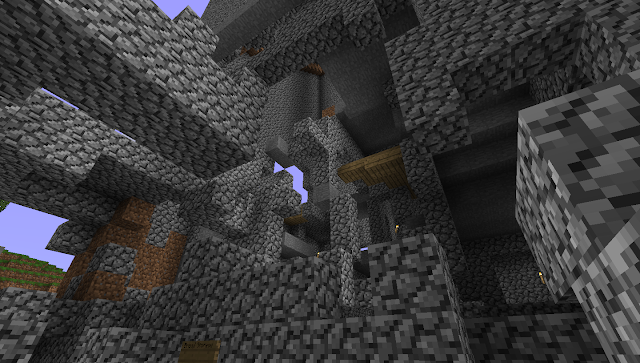 Spawned villages offer welcome shelter and sustenance. 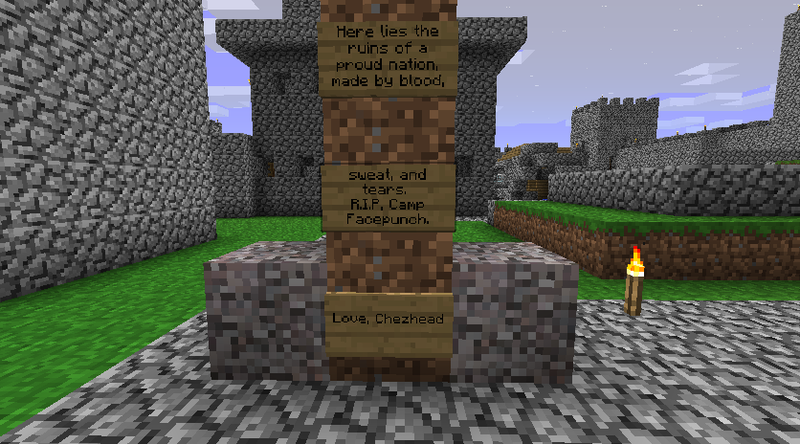 One can easily forget that they are on a multiplayer server, quietly building their base alone, deep in the wilderness. But this is an illusion. 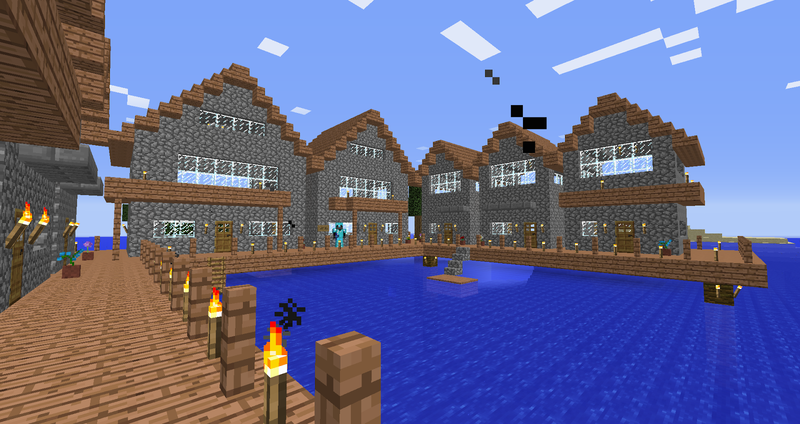 In reality, many great builds exist throughout the outskirts of 2b2t. The sheer size of the server can sometimes make them difficult to find, especially when they depart from the main axis lines, but they are not at all uncommon. In some cases, by sheer accident, they can be found only a few thousand blocks apart. 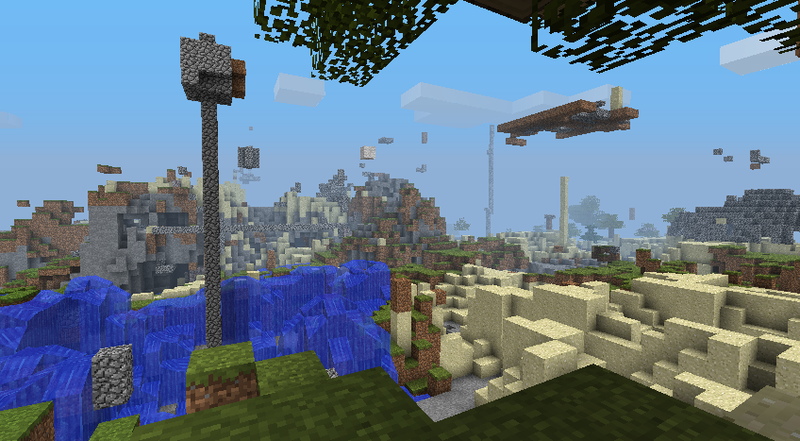 These builds are typically different from those found at spawn. Some have survived untouched or unvisited for years. 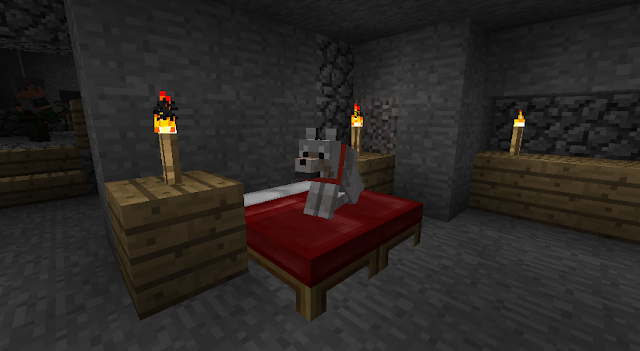 They more often include intricate redstone machines or great fortresses filled with elaborate décor or unusual mobs. They are amazing to come across, particularly after weeks of painful travel, and they regularly offer a chance to explore, rest, and recover. One such build is Avalon, the City of Peace. 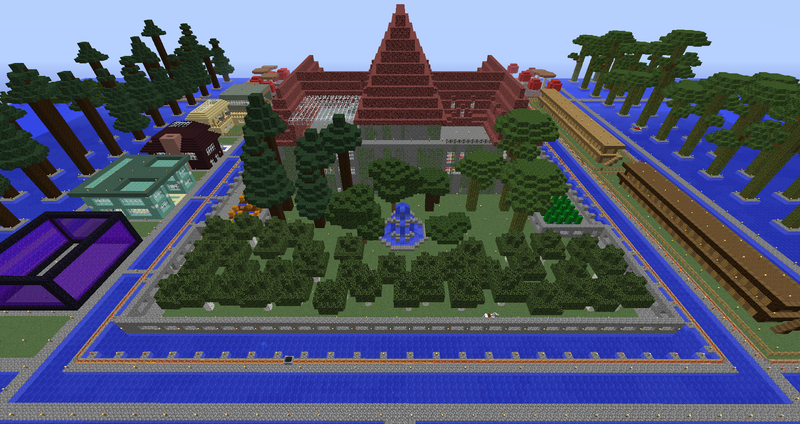 Avalon was created in 2013 after I undertook to leave the chaos of spawn and see what else existed on the 2b2t server. Like others before me, I followed nether highways to hidden bases and even the ruins of great cities long since destroyed. 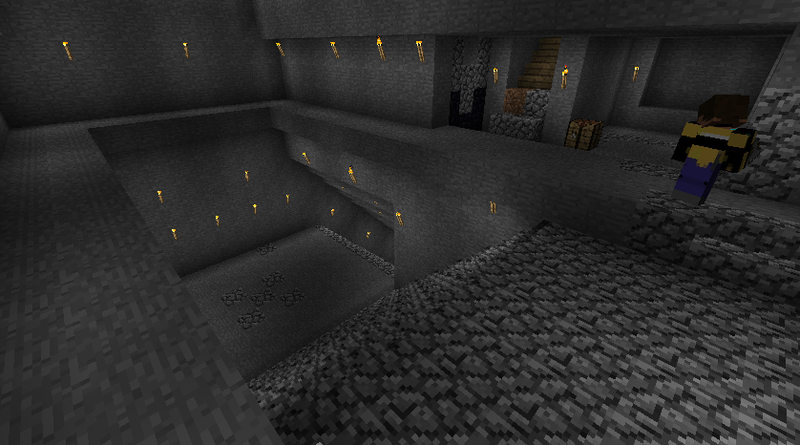 I reached 100,000 in the nether (or 800,000 overworld) thinking I had traveled some great distance. Little did I know that this was only the beginning, and that the real work would begin when the nether highways ended and the long walk began. Ultimately I settled in the middle of a distant ocean, an unlikely spot with no immediate access to any resources. I started building, importing everything I needed from distant shores where I created temporary mini-bases to gather supplies. Construction was painfully slow. As faction wars ended at spawn, I built ocean roads in all directions from my small base. As the Valkyrians took part in their spawn incursions far away, I built underwater passageways leading to massive tunnel systems, critical for material and to provide access to various biomes. As Asgard 1 was abandoned and Fenrir and other great cities were founded, I began construction on a great castle, with four floors above ground and roots travelling deep below the ocean. Then came the farms and houses, ranches and marinas. The great city of Avalon had emerged. Named after the island where Excalibur was forged and where King Arthur traveled to recover from his wounds, Avalon remains a castle city - an island refuge for the weary traveler seeking to heal, rest, and fill their stomachs. All are welcome, so long as swords are left in their sheaths, and grievances and hate are left at the city gates. Storage rooms are available with virtually any type of item a player might need. A general store run by a zombie pigman is available for trade. 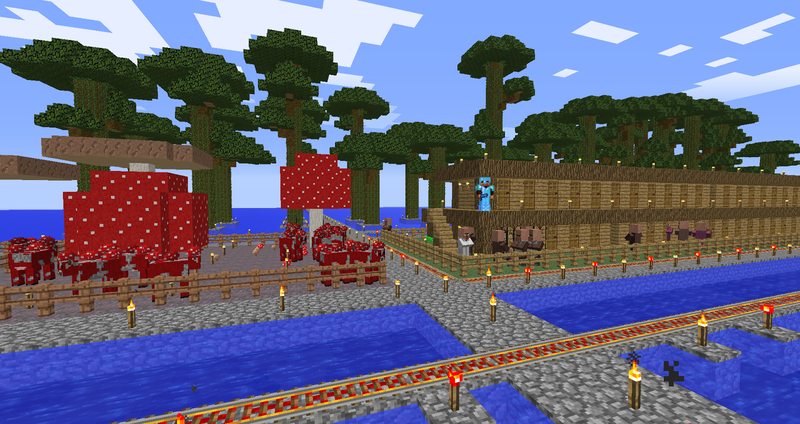 Food is plenty ranging from steaks and cooked salmon, to cake and entire chests of mooshroom stew. Fields of wheat, potatoes, carrots, melons, pumpkins, cocoa, cactus, and sugar cane are also available. There is an abundance for everyone. 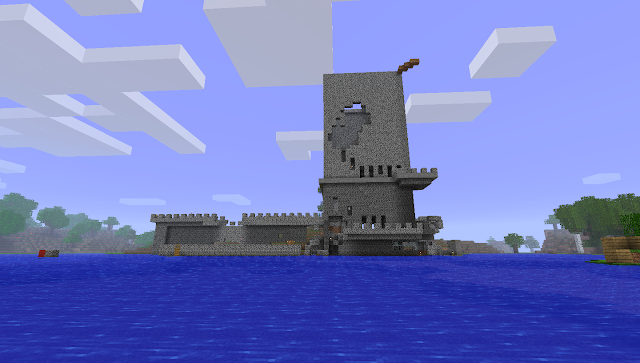 Over time Avalon has expanded from its central castle, father and farther into the ocean. 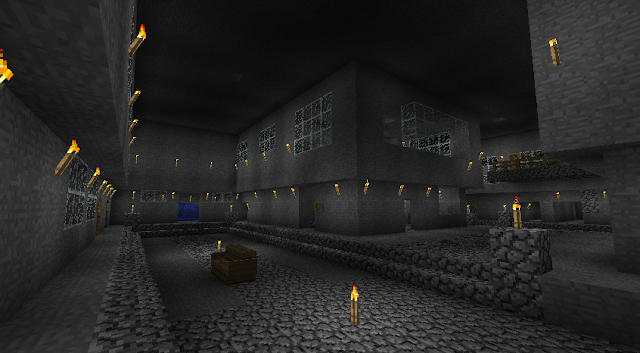 Villager condos were built to the north after captured zombie villagers were cured. 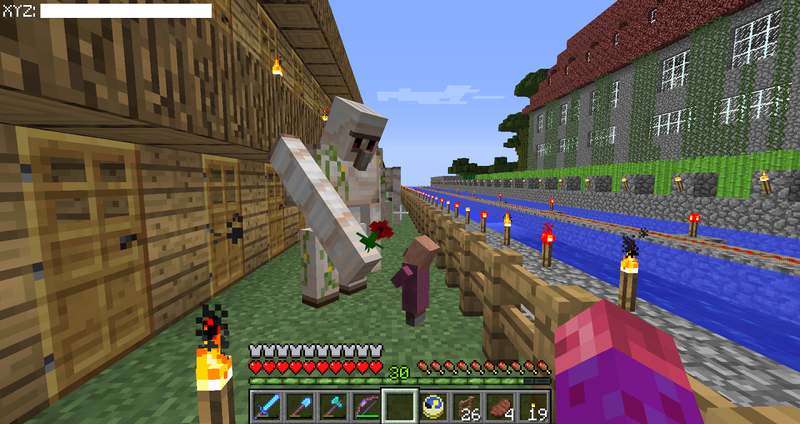 As the population grew allowing for a full range of trade, so did the number of iron golems looking after them. Residential properties were built to the south. Birch homes were erected with sunroofs, porches, and multicolored sheep as household pets. 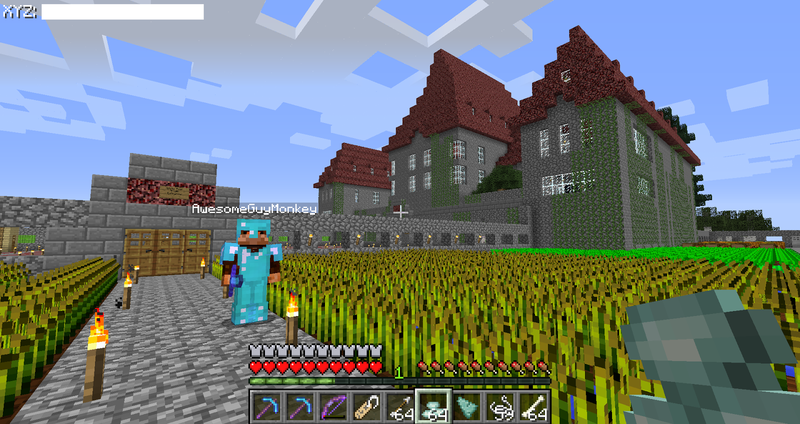 Other builds included nether brick homes with fireplaces and pools, and prismarine brick homes filled with pigman families and sponge beds. To the west, manmade mushroom islands were created complete with mooshrooms and mycelium imported from far away. 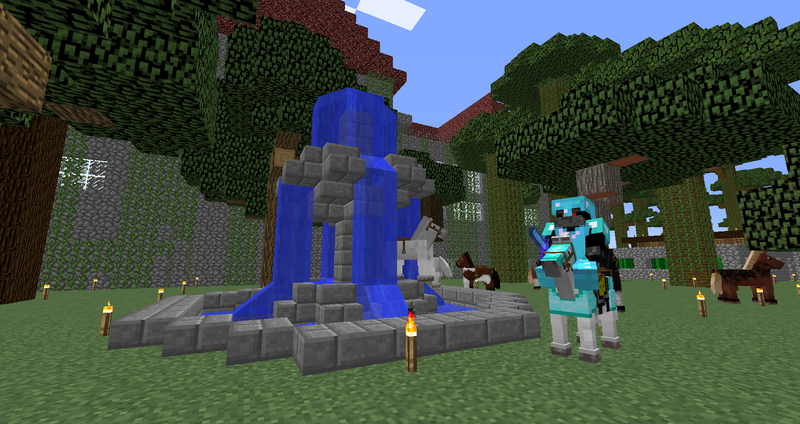 To the south, a second courtyard and ranch was constructed with grass, birch, oak, acacia, jungle and dark oak trees, a central fountain, and every possible variety of horse and armor. Gardens were later added to the castle, offering a more colorful oasis within the castle walls. Around the central core of the city floating forests were constructed, including giant spruce to the south and giant jungle trees to the north. Ocean roads became lined with oak and other floating trees as well, as was the case with the recently renovated south marina ready to meet those travelling north. The expanding size of Avalon necessitated a powered rail system that now circles the central part of the city, with similar systems expanding onto ocean roads. But these still pale in comparison to undersea roads which reach everywhere from taiga and jungle bases, to ocean monuments. The city of course is connected to the nether as well, where other sub-bases exist with pathways linked to two nether fortresses. Avalon continues to grow beyond the confines of the city core. Like a web of cobble and stone, its new roads and structures weave across a deep blue sea filled with squid and packs of angry guardians stripped of their ocean monuments. An industrial section is currently under development with a focus on automated farms and grinders necessary to meet the city’s growing needs. A museum is also in the works, with a focus on the history of this great server and the groups that have contributed to it over the years. Avalon remains a Geneva of sorts, a safe neutral ground waiting for those that can find it. It does however have defenses against those who might do it harm, as well as its secrets to reveal. But what lies within its castle walls or in its deepest dungeons is a discussion for another day, for Avalon does not sleep, nor do some of its permanent residents.